Our Juliet long dressing gown is a romantic and versatile piece that is sure to become a cherished treasure after the wedding as a reminder of such a special day. Featuring long sheer sleeves and a deep V neckline. Handmade from exquisite French Chantilly lace and lined in diaphanous tulle. Worn over a simple gown will instantly transform your look. Adding French lace will elevate your bridal lingerie, or boudoir look. Long flared sleeves add a layer of bohemian luxe and flawlessly showcase the gorgeous floral design throughout. Lace motifs create a subtle evanescent illusion as the dense florals climb up from the bottom of the robe and seem to drift away from the neckline towards the shoulders. This perfectly shows your gown details while layering and adding just enough coverage. Elegant by nature, our Juliet robe is the perfect mix of effortless luxury. 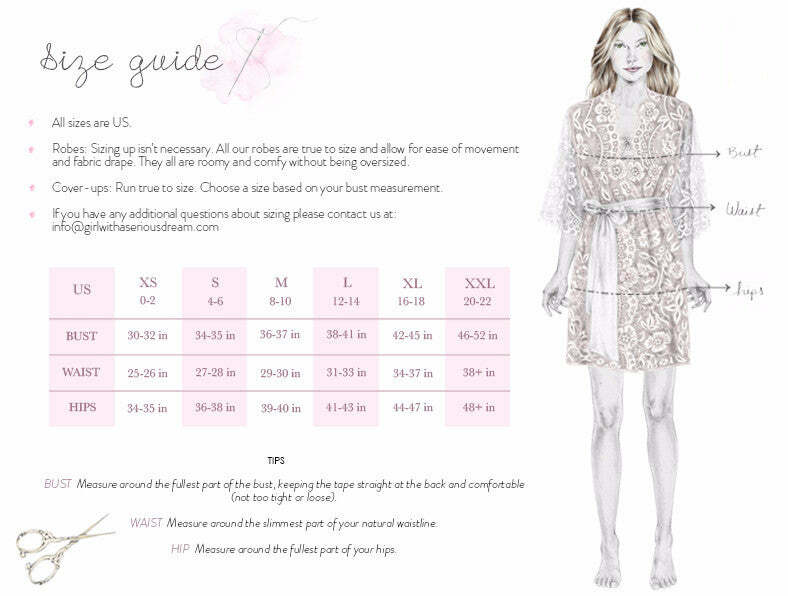 Wear as a getting ready piece or elegant boudoir cover up. Add an ethereal atmosphere with this perfect combination of French lace lined in tulle.